Happy Weekend! Ready to tackle a few more last minute handmade gifts? I'm kicking things off with a little Holiday Sale in my online shop. 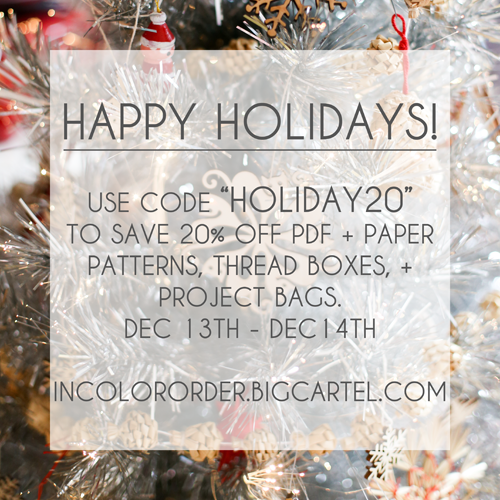 Save 20% on everything when using code "HOLIDAY20" at checkout. Good December 13th (today) to December 14th. There is limited stock available of the thread boxes and project bags, so get them quick! I will not be ordering/making more until the new year. Starting Friday, December 19th, the shop will be closed until January 5th. *Side note: I am teaching today at The Sewcial Lounge in Madison from 10:30am-4:30pm, so if you email me during this time, I will get back to you as soon as I get home! How nice!! Thanks, may treat myself to a few of your cute patterns.